Rain Date: A rain date shall not be scheduled. If the tourney cannot be played on September 2nd, it will not be played. Please DO NOT register for this tournament unless you are reasonably certain you will be able to attend. If, after registering for the tourney, you find you cannot attend, please be considerate enough to manager tandems and those on the alternate list to notify the league office as soon as humanly possible. Cost: $20.00/player (2 games guaranteed). The entry fee is a little higher than normal to help raise money for JoAnn and Bernie Marsh. All proceeds will go directly to them. This is a 1-day coed softball event. Eight teams will be formed entirely through a draft system based on individual player statistics. The 8 teams will then compete for the 1-pitch title. Each batter receives 1 pitch. If the pitch is fouled off, swung at and missed, or hits the mat behind home plate, the batter is struck out. If the pitch is a ball, the batter walks. The rest of the game is played in normal fashion. Winning teams will receive their choice of custom jackets or sweatshirts. Plaques and trophies will be awarded to the winning managers and tournament MVP's. This is a great day of softball, fun, food and drink-- kind of like one big picnic where a softball game breaks out every 50 minutes. It's also a great way to meet other Softball America league members. Bring chairs, tents, coolers, and whatever else to make yourself comfortable. Make a day of it or come and go as you please. Along with 8 manager tandems (16 players), an additional 88 players can register to be drafted. The minimum player breakdown is listed below. 1. Core/eddie walk rule will not be observed. 2. 2nd foul ball will not be observed. 4. All roster players must be in the batting line-up. 5. Batting line-ups must consist of alternating core/eddie beginning with the first or second batter. Please know it is entirely possible you could be drafted to a tandem or end up on a team with people you don't like. If that is something you won't be able to deal with, please don't sign up. And please don't be one of those people that signs up, gets on a team you don't like, then makes an excuse to bail out. Remember, this is softball and it's softball for a good cause. Let's try and have fun and do good at the same time. Could you please clarify this aspect of the tournament? Sorry if this is explained elsewhere and I missed it. "5. Batting line-ups must consist of alternating core/eddie beginning with the first or second batter. " "Along with 8 manager tandems (16 players), an additional 88 players can register to be drafted. The minimum player breakdown is listed below. These numbers indicate that the target core/all-star : eddie ratio for each team is 9 : 4. With 8 core/all-stars and 8 eddies already represented in the manager tandems, should number of core/all star registration spots be 64 and eddie registration spots be 24? The current registration spot distribution (60 core/all-star, 28 eddie) seems to target an 8.5 : 4.5 ratio. Perhaps you are simply aiming to bolster eddie numbers, which is great. My main question, which remains regardless of whether the ratio is 9 : 4 or 8 : 5 or somewhere in between, is how can batting lineups alternate core/eddie with such a minority of eddies? Or is the requirement only to alternate at the top of the order until all eddies have batted? A team could therefore draft the minimum of 3 eddies to fulfill eddie batting and fielding requirements, and then construct a batting order wherein 2-4-6 are eddies (or 1-3-5), and then all hitters from 7 through 13 are core. We have 8 tandems consisting of 8 core and 8 eddies. I want to have a minimum of 4 eddies available for each team to draft. That would mean we need a total of 32 eddies. There are already 8 eddie managers so we need a minimum of 24 in the body of the draft. Yes, I originally had the core total at 64, but eddies were signing up at a relatively faster pace than the core so I added 4 spots to the eddie count and took 4 away from the core count. Remember, I was talking minimum, not maximum. If I have some core openings and zero eddie openings and an eddie signs up, I will add an eddie spot and take away a core spot. It's first come, first served. Yes, alternate at the top of the order until all eddies have batted either in the 2-4-6, 2-4-6-8 or 1-3-5, 1-3-5-7 spots. This will increase the value of the eddies in the draft and make it more of a coed tournament than a men's tournament with eddies sprinkled in here and there. A perfect example just came in. At this point I have 36 eddies (8+28) - 4 more than the minimum. I have 4 core spots open. Bob Louderback (me) just registered. I will add him to the eddie count and remove 1 core spot - putting us at 37 (8+29) eddies and 67 (8+59) core. First come, first served. Ah, so the "minimum" was in reference to the total eddie count of 32 (4 per team). Great, makes sense! Thanks for clarifying the batting order question too. That has interesting strategic implications for both drafting a team and constructing batting orders. Pretty cool! Your message is very much appreciated. JoAnn is doing well and I am getting better. I was at the field for awhile yesterday. We will never be able to express our gratitude for the outpouring of love and support we have received from you and the entire SBA family. Justin Miller and Lindsey Tuscano can no longer manage as a tandem in the 1-pitch tourney. The first alternate tandem of Stephanie Thrasher (fe) and Mark Bernacki will replace the Miller/Tuscano tandem as team #8. Justin Miller and Lindsey Tuscano will replace Stephanie Thrasher and Mark Bernacki in the body of the draft. We have a problem. No, I have a problem. The numbers on the core player draft candidate list somehow became corrupt on my Excel sheet. If you look at the numbers and names posted, #257 is Mike Cianfici. It then goes to 259, back to 252 and then to 257 again. It should have stopped at the first 257, but it didn't. That means we have 8 players too many. Everyone from Greg Reilly to Jamal Covington should have been on the alternate list. With everyone signing up so fast, I guess I got lost. Ugh! I can think of 4 options, all of which have consequences. 1) We can add a 9th team. All well and good until you come to realize Team #9 gets a first round bye. Manager tandems could very well cry foul and I would understand why. 2) We can add a 9th team and redo the draft lottery. Manager tandems could very well cry foul here as well and I would understand why. 3) We could keep the 8 players and draft 14 per team. 4) We could drop the 8 players and that would make me feel like sh!t. I am sending emails to the manager tandems asking for their opinions on how to handle this mess. As I'm sure not everyone is going to see it the same way, the only fair thing to do is use a majority rule. My personal opinion is that this is for The Marsh family, having a 9th team would bring in more money for them. People bitching would be unacceptable as this is for one of our longest SBA family members and their whole family. I am not part of a managing tandem for this tournament, but for what it's worth, I think that Shanna makes a great point. If you did add a 9th team, that team would not get a 1st round bye, unless I'm mistaken. Rather, that team would play against one of the other 8 teams to get to the "first round". Another way of looking at it is that 7 teams would get a 1st round bye. I agree with Shanna as well. And not just because I'm one of the 8 at the end of the list. But more for the fact this is to help out the Marsh family. A bunch of SBAers that have not played in a 1 pitch in awhile have signed up for this reason as well. This long time teammate of Bernie's included. You could just take the last 8 core and give us the first 5 eddies on the alternate list and call us Team 9. I'd be ok with that squad. Go with 9 teams. Previous posters all have excellent points. Andrea Ramunno can no longer attend the tournament. Alternate Krissy Bartynski (fe) will replace Andrea in the body of the draft. The tournament will now run with 9 teams. Big deal, so it adds an hour and a half to the day. It's a charity and it's for Bernie. We have one other problem that needs to be resolved. 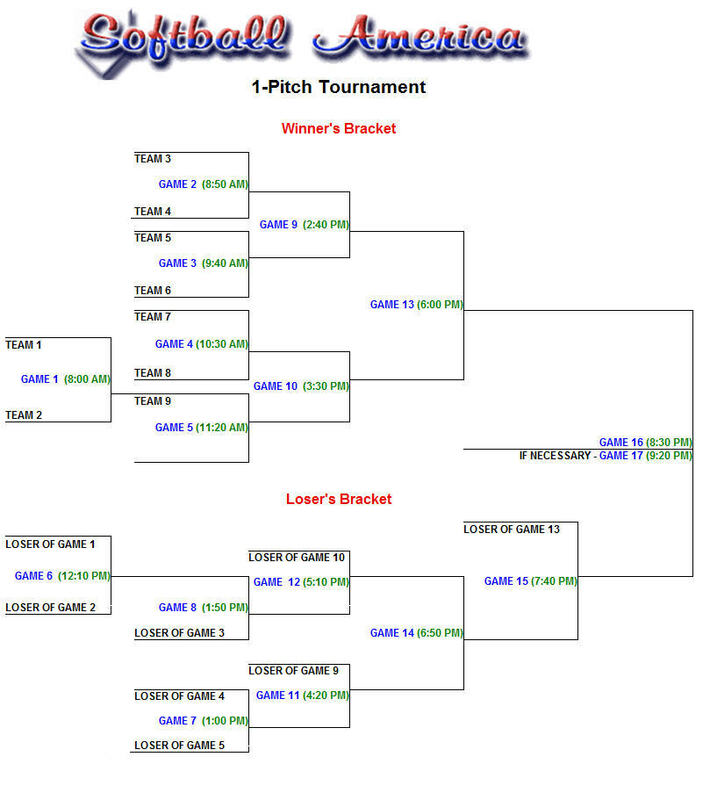 Most of our umpires are playing in the 1-pitch, leaving us a little shorthanded for the tournament. Curt Hensman will become Team #9 and umpire the first 4 games. There is not an impartial bone in Curt's body. I am confident he will call the games without any bias whatsoever. If you feel otherwise, speak now or forever hold your peace. Once again, it's a charity and it's for Bernie. Team #9 does not have a bye in Round 1. Teams #1 and #2 play the 1st game and Teams #3 thru #9 play in Round 2. I was going by memory when I stated that and I was wrong. Look at it this way, Teams #1 and #2 get more bang for the buck. Again, it's a charity and it's for Bernie. Bob Garges and Michelle Egitto will move into Curt and Catie's spot as Team #6. Alternates Dan Keith and Linda Dart will take Bob and Michelle's place in the body of the draft. PLEASE READ CAREFULLY - in order to maintain the female eddie to core ratio, 2 female alternates had to be added to the body of the draft to give every tandem the opportunity to draft 3 girls. In addition to the 8 players on the draft list that got there as a result of my error, we needed to add 1 more core player. That belongs to Tom Finn. I apologize for this debacle. After 20+ years of tournaments, this is a first. Yeah, I know. Bring on the old age and Alzheimer's jokes. Good save. I think everyone will be happy. Joe Horchuck can no longer attend the tournament. Alternate Matt Schaub will replace Joe in the body of the draft. Male eddie Mike Evans can no longer attend the tournament. Alternate female eddie Kelly Neill will replace Mike in the body of the draft.